Jessica Bomford is a journalist, writer and nagger-in-chief to her three sons. Her life changed course when her second baby turned out to be identical twins, and has remained on an uneven keel ever since. She is married and lives in London. 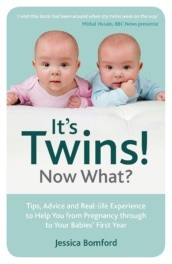 If you would like to tell Jessica about your twins or have any comments about the book, join the It’s Twins! Now What? community at www.facebook.com/twinsnowwhat.